Readers’ panel: Is investment in nursing degree apprenticeships value for money? The appeal of nursing degree apprenticeships is obvious: they allow employers to use students as an extra pair of hands and students get to earn while they are studying. Whether this route will prove as effective as the university model remains to be seen, but I believe that the funds used to create it would have been better spent on improving access to the existing route. University education for nurses is tried and tested – why mess with a winning formula? The apprenticeship scheme is one way of taking a vital broad approach to nurse training. But if employers cannot afford to train enough apprentices, surely it is set up to fail? According to NHS Employers chief executive Danny Mortimer, inflexibility in the way the apprenticeship levy can be used and lack of additional investment from the government means employers are being ‘priced out’ of using apprentices. This scheme needs proper government investment if it is to be successful, but I won’t hold my breath. 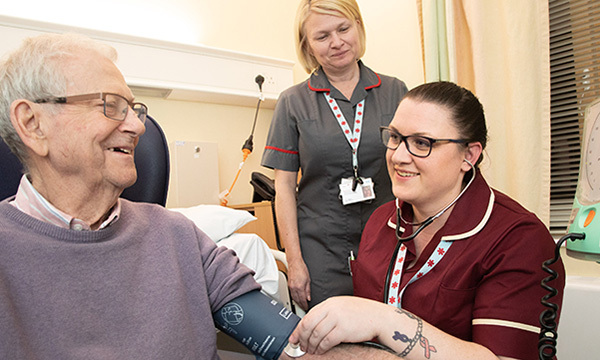 It may be more expensive to train nursing degree apprentices, but they are getting paid to work and to train, while undergraduate nursing students don’t get paid and those in England have lost the bursary. It has been highlighted time and again that undergraduate nursing students are effectively doing a full-time job, for free, with no funding, and the nature of the course makes it difficult to find part-time work. Is undergraduate nurse training cheaper at the expense of the students? This is more important than counting the coins. Although the apprenticeship scheme allows another route into nursing, the cost in comparison to undergraduate nurse training does seem steep. I would like to see more funding allocated to training nurses at undergraduate level. But a nursing degree apprenticeship is not the same as undergraduate nurse training and we need to look at the value and benefits of the scheme – both to patients and the healthcare setting – before deciding whether nursing degree apprenticeships are value for money.